Thugs and goons. Thugs and goons. Thugs and goons. Thugs and goons. Soundtrack courtesy of Monty Python. Don't want to piss anybody off, eh? 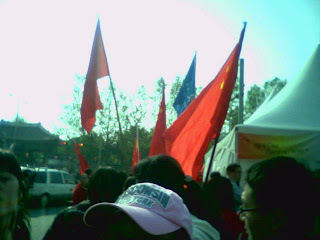 Saw history today right out in my face, waving flags, noisy feet forward. Sure, it wasn't Ground Zero, Archduke Ferdinand-level history -- I won't get a book deal just for surviving it, but dear readers, I saw history nonetheless. 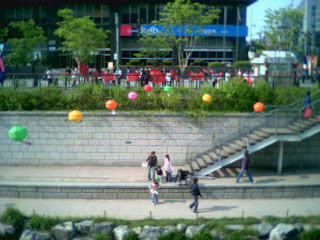 It started innocently enough -- I went to a Seoul Writer's club meeting near City Hall. 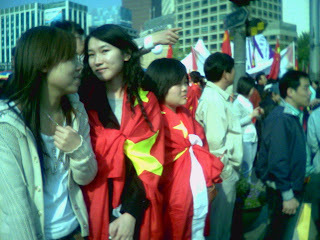 . . but on my way over there, I noticed what looked like a new trend in fashion accessories: red capes with yellow stars on them. 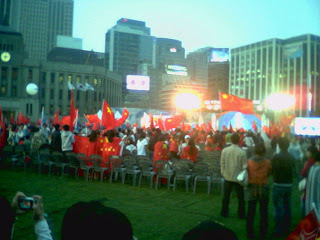 On second glance, I realized what they were: Chinese flags. 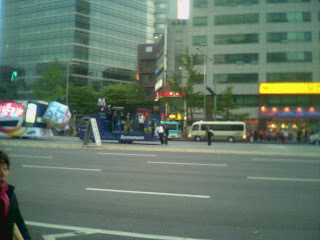 The Olympic Torch came through downtown Seoul on Sunday afternoon, starting at Olympic Park (where I lived in 2003) and ending in Jongno, by City Hall (where I live now.) You may have heard some rumours about protestors hectoring the Chinese Olympic Torch Relay -- over in Paris and London they caused a fair bit of embarrassment, and San Francisco bent so far backwards to avoid turmoil and embarrassment (and a pissed off exporter of cheap plastic toys, clothing, and shoes), that it wasn't so much a relay as a game of hide-and-seek. 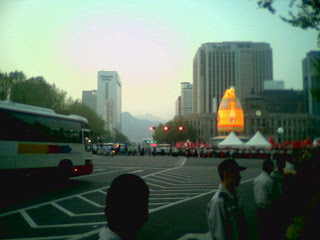 Starting a fifteen minute walk from City Hall, the boosters came out in Red. 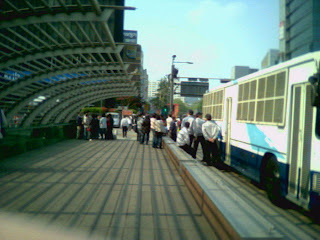 And the riot police buses came out, too. I don't know where they got so many, huuuuuge flags (I know I took my wall-sized flag out of the suitcase when my luggage was overweight at the airport), but they were literally everywhere. Recently, Chinese news sources and netizens have responded to protests and criticism with hurt outrage: the Western Media wants to sabotage our party; like ants at our Olym-picnic, those biased Western journalists want to ruin our fun! And meanwhile, back home, the propaganderthals in charge of the media are playing up the us-vs.-them narrative to stoke nationalistic rage. 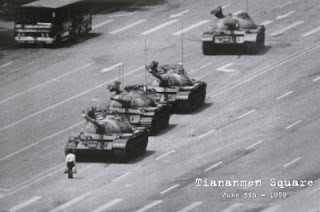 Meanwhile, anyone who suggests that this kind of hurt-pride defensiveness is less than the best possible way to respond to the attack, is thrown, nay, hurled up against the wall, gored on the spike of nationalistic pride, slaughtered as a scapegoat: a Chinese student at Duke University had her picture and her parents' address in China published on the internet (scroll down after the link to see a youtube clip, and read the poison on the Chinese comment board, too). She was attacked on the net (and her parents house was vandalized) for stepping between a group of Chinese boosters and Tibetan protesters having a holler at each other, and trying to suggest that, in the spirit of free speech, the Chinese boosters ought to stop shouting down their pro-Tibetters. (She should have sided unthinkingly with her fellow Chinese and found something heavy to use as a weapon -- anything short of that proves she hates China and might be a spy, it seems). 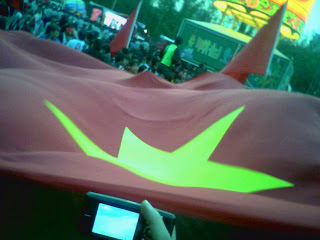 Giant flag. Big as my classroom. And blurry. Moving quickly as they shook it. Things are ugly back in the mainland, too, and even paralympic athlete Jin Jing, who protected the torch from protesters in Paris and became a hero to the Chinese nationalists, couldn't talk them out of their "Boycott Carrefour" fervour -- instead, they turned on her, too. It must feel pretty lonely to be ostracized by a 1.3 billion strong nation -- the most I've ever been ostracized by is an elementary school class of twenty-six. There's a new strategy in play with this [debacle] torch relay: it started in Australia, and will rear its head, no doubt, through the rest of the torch relay. 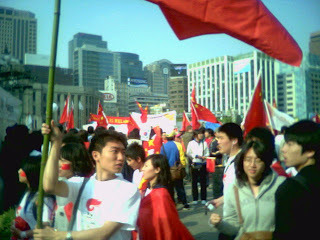 On Sunday, 6000 mostly young Chinese, probably overseas exchange students, descended upon the torch trail in force, wielding huge flags (big enough indeed to block a Tibetan flag from view), waving them, and chanting pro-China, pro-Beijing Olympic slogans loudly (loud enough to drown out any protesters, in fact). This kind of a preemptive napalm-strike strategy works, insofar as it drowns out any voice of dissent in an ocean of unison, marching in lockstep, chanting in time, and they might have needed it: South Korea has its own grudges with China, including a historical grudge about the kingdom of Goguryeo, and (the big one) the Chinese policy of sending captured North Korean refugees back to North Korea (to near-certain torture and incarceration in a death camp). 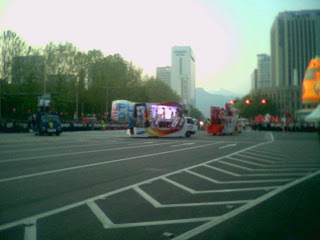 In fact, a North Korean protestor tried to jump in front of the relay route and set himself on fire in protest. Here are some pictures I took, making a strong case for my need for a better camera. I wasn't getting closer to the scrum than that. Robert "If your pictures aren't good enough, you're not close enough," Capa I ain't. 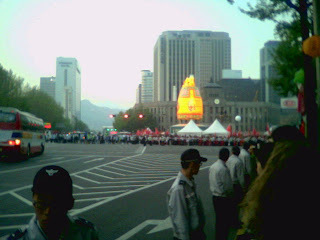 What you can't see is the torch actually moving along the column of gray-shirted police officers. As far as I could tell, the basic goal of the Red Army Escorts was to haul any protester to the ground as fast as possible, hopefully before any media outlets pointed their cameras. This Tibet protester was beaten down in the lobby of four-star Seoul Plaza Hotel -- I'm told the crowd is chanting, among other things, "Apologize" and "beat him to death," as the police surround him. Bullying and intimidation, friends. When you don't want to listen to criticism, making a fist and snarling "shut the hell up" will do. It was kind of disgusting. The Olympic spirit is dead to me. More video. 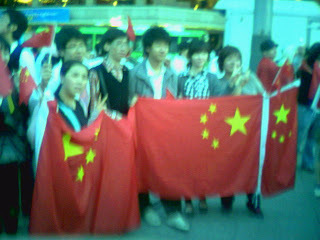 Watch them fast, before the Chinese government demands they be taken down, and the news agencies (naturally) comply. More pictures, courtesy of Stafford, and Smokehard via the Marmot's hole -- the downtown area where I was. . . with a better camera than mine. 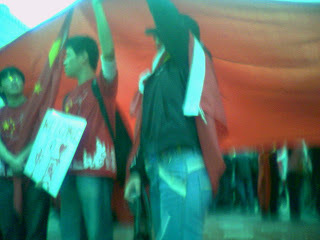 From Stafford: the biggest Tibetan flag scrum I personally witnessed (video here) was about ten meters over from where this picture of loyalists was taken. -- just repeat the party line, louder than the dissenters. Effective strategy for their purpose. 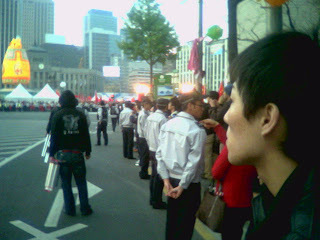 8000 Seoul police came out to keep order. 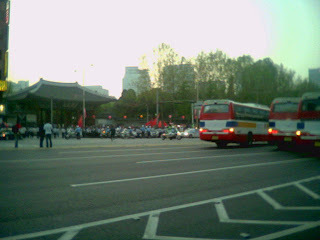 The lump of red in the middle of the picture are Chinese flags thrown up to mask a bunch of Tibetan flags that had just appeared. 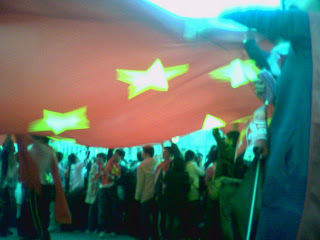 Before the police got there, all the Tibet protesters had been hauled to the ground, overwhelmed by rabid China-boosters. 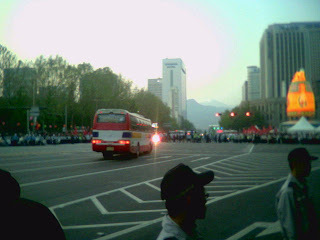 Vehicle escorts: a big bus gives protesters another obstacle to get around, and increases the chance they'll be intercepted before they can reach the torch. 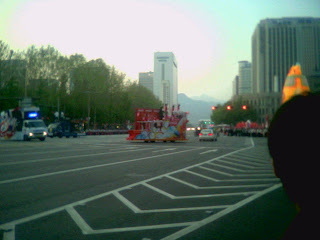 Coke led the procession in a shiny float. Write a letter to Coke and tell them you won't buy more Coke products until they withdraw their sponsorship of the Olympics. In the hotel lobby again. 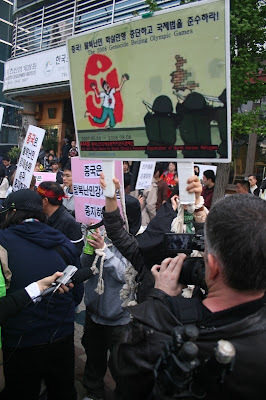 The ugly, disrespectful (to Korea, to Korea's police force, and to Korea's laws about freedom of expression), disruptive behaviour of China's own citizens in Seoul and other cities is more embarrassing to China than any protest could be. Some of the facts in this video montage are off base -- it's not a policeman stabbed, but a journalist hit by a projectile in the picture of the guy in green bleeding from the head, and I can't vouch for the text that goes with the footage in the other countries. . . but just look at the footage! 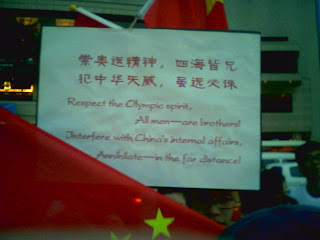 The Propaganda Olympics will go on -- really, whether they go smoothly or tank doesn't even matter to China anymore. Either they go badly, and China can use the embarrassment to stoke the "West hates us" resentment for their propaganda purposes -- a powerful, angry country full of rabid nationalists is just perfect if China decides to go expansionist, or the Olympics go well, and China can use it to strut and preen, declaring they're "arrived" as a major world player, and fuel the nationalism that way. Last word goes to this kid: a sign held by a college-age student with big old glasses, standing quietly (but confidently: he has 1.3 billion brothers and sisters standing behind him). 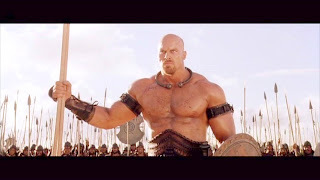 All men -- are brothers! Annihilate -- in the far distance." Somehow the first and last two lines don't quite match, eh? And how does the threat of annihilation fit with the proclaimed wish for a peaceful torch relay? Dunno. Not that I was going to ask him: don't care to be wrestled to the ground and sat upon by 6000 angry China-boosters. Yup. The intimidation worked. Korea was under the colonial rule of the Japanese Empire between 1910 and 1945. During the Japanese occupation, thousands of Koreans were used as test subjects (guinea pigs) in secret military medical experimentation units, such as Unit 731, Unit 516, and many more. Towards the end of the colonial period, the Japanese military scientists were working on a new project, which was a "vampirisation process" on humans through genetic alteration. If the project proved successful, the "supposedly-dead" could remain alive through parasitic life sustenance - a biological mechanism that mimics the blood-sucking vampire bats and leeches. The Japanese Army paid some poor hapless Korean parents to allow the medical officers to perform the experiments on their children. However, the Korean parents involved in the transaction believed that the experiments were merely another series of medical trials, and were not aware that it was actually a vampirisation process. Theoretically-speaking, the success of this project would allow the Japanese Imperial Army to utilise the "undead" as "immortal soldiers" to fight through the end of World War II. The project, however, didn't seem to yield any immediate nor apparent result, as the Korean children in question didn't seem to show any physical sign of becoming "vampirised". The medical officers could not find any sort of cell mutation nor behavioural change in these children. The project was finally abandoned, when the Japanese Army were forced to surrender to the Allied Forces in 1945 after the American dropped the atomic bomb on Hiroshima and Nagasaki. All documents and project facilities pertaining to the said experiments were destroyed, so as to eliminate evidences of the Japanese Imperial Army's atrocious deeds. The children grew up normally - some of them joined the US-led South Korean Army (known as the Regiments), while some of them embraced communist ideals and became the insurgents (known as the Guerrilas). 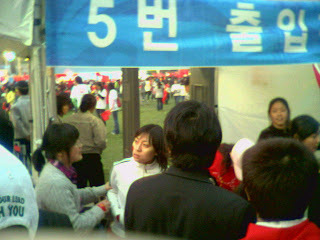 The two remained at war until the "Jeju Massacre" , which claimed the lives of more than 60,000 people. Their bodies were then sealed in the volcanic cave of Mount Halla. Amongst these 60,000 people were some of the test subjects who were earlier involved in the vampirisation process. The vampirisation process only became effective when these dead bodies were laid in the cave. The geological conditions (temperature, mineral make-up, etc) of the volcano cave helped to promote the vampirisation process, and their genetic structure mutated to resemble the feeding patterns of bloodsucking creatures such as bats and leeches. Thus these group of the dead were resurrected to become vampires, as they acquired the ability to shapeshift into bats, and back into their human form. They are now doomed to roam the streets of Jeju seeking living human prey and continuing the battles that they once fought in life. Thus, the bitter feud between the two mortal factions – The Regiments (former soldiers) and The Guerrillas (former rebels) – has now become immortal. Today, we meet Han Mirae, a young Korean girl who is caught in a love triangle between Jackie Chang, a swashbuckling vampire hunter from Singapore, and Shin Taewoo a powerful vampire of the Guerillas. And, we meet Kim Hyunsuk, the Regimental, who abducts Mirae in order to set a trap to kill the other two. Can Taewoo or Jackie save the girl in time? And who is Mirae's real love? I think he meant YOU would symbolically annihilate HIM/his country, didn't he? Annihilate in the long distance, indeed! Sweet! Where are the protestors? Holy cow it's a proper crime wave!